With a scheduled departure at 1:15 PM from Chicago’s O’Hare International airport, we await the arrival of our Uber Wednesday morning. Our first leg of the flight has us staring down a 16 hour non-stop (I didn’t know a plane could remain aloft so long) to Hong Kong. Then a 3 ½ hour layover before wearily shuffling aboard another flight to Saigon for a total travel duration of 24 hours. From the sun’s perspective, we’re 12 hours ahead of home, so even though we arrived at midnight our sleep deprived brains insisted it was noon. Arriving at Ho Chi Minh City airport, bilingual signs effortlessly direct us to the visa counter where we present our documents and the tidy sum of $135 (each) for a one year multiple entry visa. Then clearing immigration and customs which was a snap. An ATM withdrawal makes one feel extremely wealthy as I pulled two million Vietnamese dong from the machine. With an exchange ratio of 22,320 dong to the US dollar, that comes out to $89.60. Note that all fees provided during this trip will be in US dollars. A 7 Gb data SIM chip cost $9 followed by a $9.86 cab ride to our hostel. Streets were quiet this early in the morning yet groups could still be seen sitting out enjoying food and drink at small tables spilling from businesses onto the sidewalks. Stepping from the taxi, we walk a narrow alley to our hostel. Three travelers from Germany were sitting on the steps, we bid them greetings before removing our shoes and stepping inside to secure our reserved room with two beds and ensuite bath. A cold bottle of lager and one of water was provided along with a room key. I don’t think a bed ever felt better but despite extreme fatigue it was still difficult to achieve deep sleep. 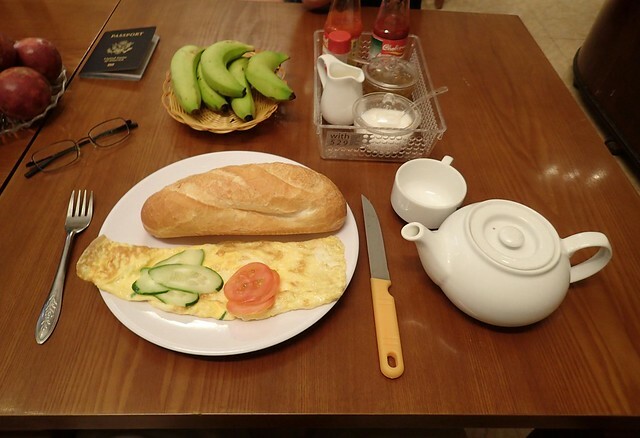 Up at 6:30 Friday morning with burning red eyes, only a short nap was realized before giving up and descending the stairs to the common area for a complementary breakfast of eggs, bananas, passion fruit a baguette and hot tea. Under strong Wi-Fi, a Google Voice call home was a nice connection to a more familiar world. 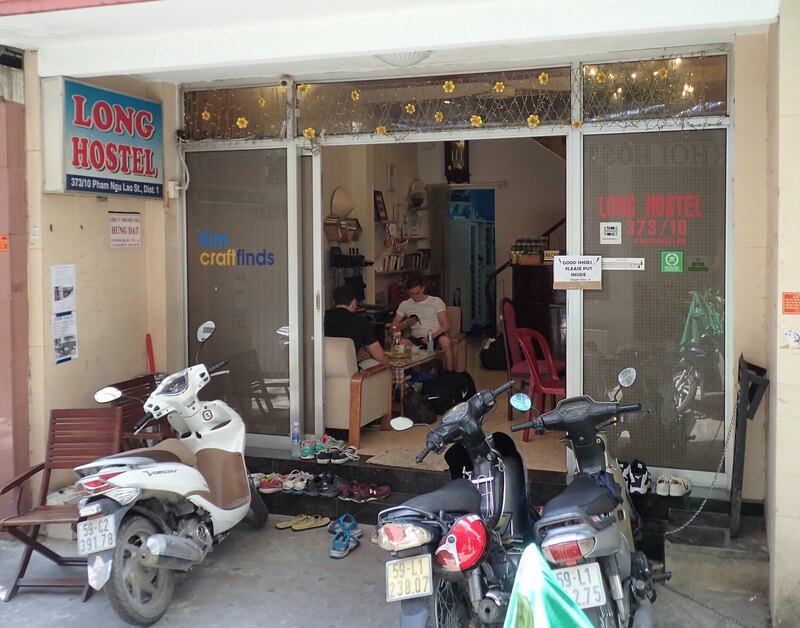 The Long Hostel, like many small rooming facilities, is located off the main streets along narrow alleys. Being too narrow for cars, the area is fairly sedate within a city that can only be described as chaotic. 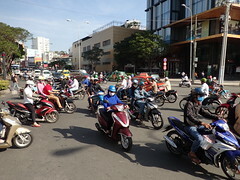 A constant stream of honking scooters whisk down the roads like the steady flow of water down a river. 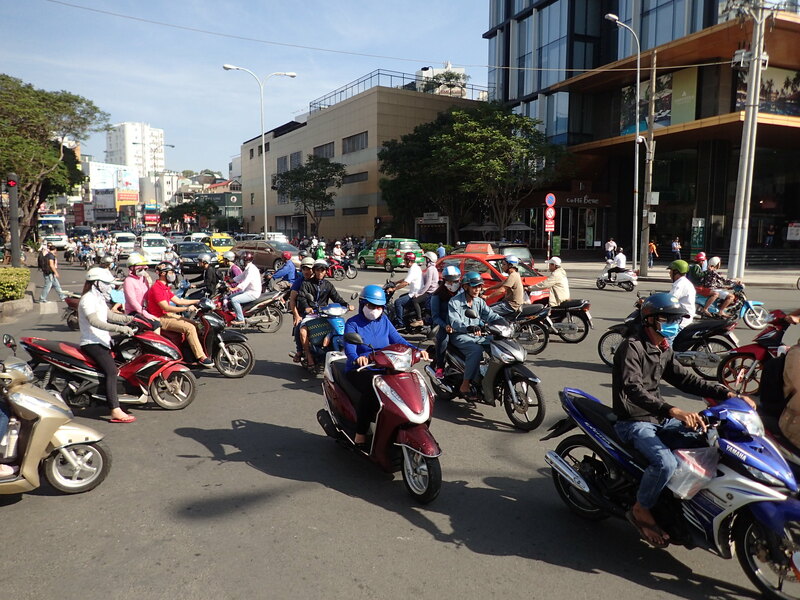 Some intersections have traffic signals where appreciated “Walk / Don’t walk” symbols temporarily dam the onslaught. Roundabouts are another story. There, the flow continues and the only way to cross the street is to step into the overwhelming din. Like a boulder placed into a river, a slow but steady gait perpendicular to traffic has the mass of vehicles flowing around your vulnerable body to reach the opposite curb. Takes a little courage and nerve the first few times. Setting off a short distance to reach the street at the end of our alley, we pass though a daily market. When we arrived late last night, nothing was here. But now over a hundred stalls sell everything from fresh fruits and vegetables to meat and shellfish, live fish and crabs, clothing, shoes and watches. There are mixed fragrances of delight immediately followed by a waft of nastiness. No doubt the 90° temperature combined with scorching infrared sunshine and stiffing 66% humidity provide the perfect catalyst for the brief yet stomach turning malodorous scents. Despite the heat index of nearly 100° Fahrenheit, scooter rider wardrobes are nearly identical: helmet, surgical mask and long sleeve fleece sweater or light coat. 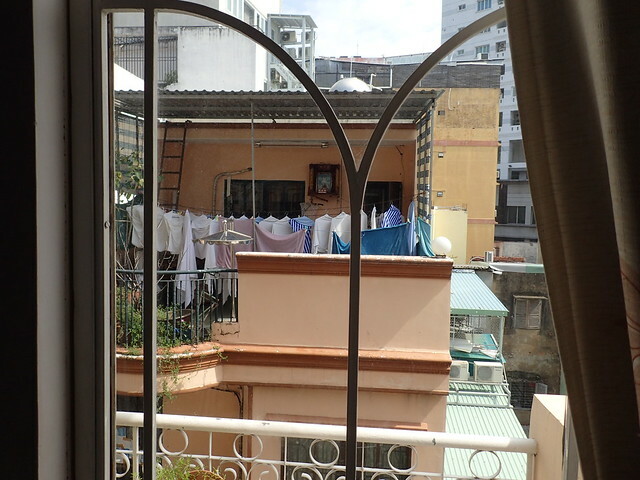 I’m practically melting in my short-sleeve cotton T. How the locals don’t pass out from heat stroke is a wonderment. Heading for the much larger Ben Thanh Market about 1 mile east, we walk through several narrow parks. Folk are playing badmitten, dancing under pavilions or getting in a work-out on public provided exercise equipment. The enclosed market is huge and annoying, hardly able to walk past any of the countless vendors without being asked if you wish to purchase their wares. One doesn’t wish to be rude but after several hundred “No, thanks” I was looking for the exit. But not before Saffron purchased a couple garments and I sat down to a plate of snails. Chewy but tasty. 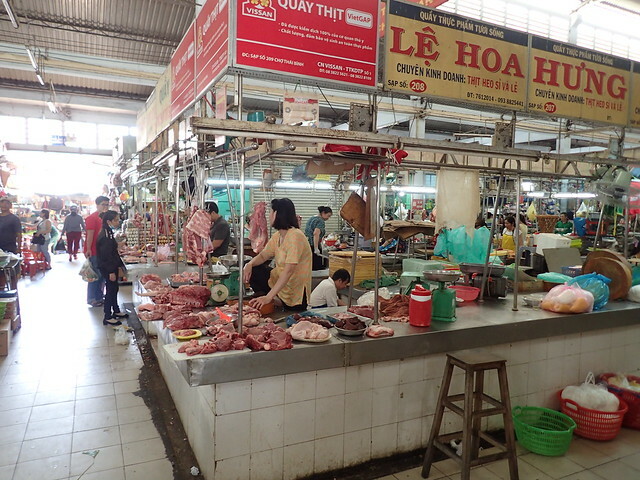 Being our first shopping experience here in Vietnam, we would soon learn that bigger is not always better: prices at Ben Thanh were higher that most anywhere else. 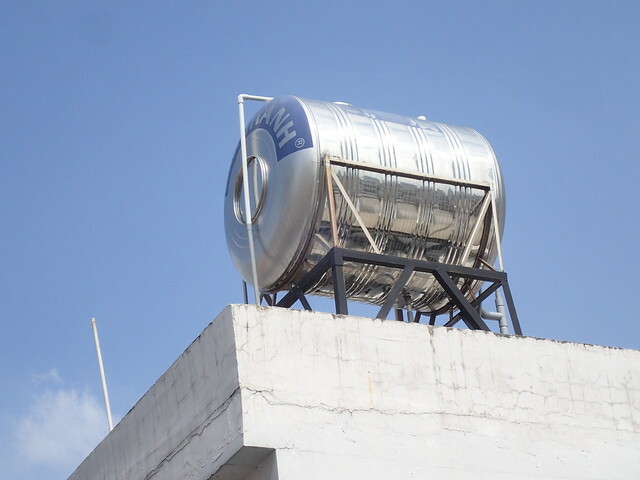 As an example, a ½ liter bottle of water at the market was 45 cents but 1 ½ liters at the hostel was only 31 cents. Back at the room, dreaded jet lag reared its ugly head and we both crashed until 7:30 pm whereby we forced ourselves from bed to grab some beers. In addition to the complimentary breakfast, the Long Hostel provides two free beers to its patrons each evening. The lobby was abuzz with guests from all over the world to socialize and cool down with refreshing suds. We made the acquittance of several travels – a young man from Germany and another gentleman from Northern Ireland, then set out around 1:00 am in search of food. After walking around for a mile or so we looped back toward the hostel and found a place serving noodle soup. 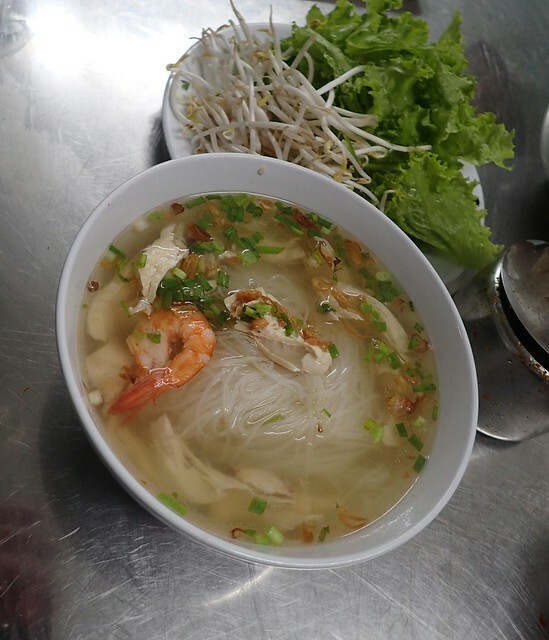 Basically a chicken soup with rice noodles, a large bowl setting me back $1.57. Walking the streets late at night there is no sense of dread or fear for personal safety. The pulse of the area is lively and jovial, people out for food, drink and socializing. I have yet to see any police presence, either in cars or on foot. You know they’re out and about but they keep a low profile to say the least. The idea that this is a dangerous place, at first glance, seems absurd. Share the post "Dazed arrival"
Love this update, Uncle Phil! Makes me sorely miss Asia.